Greenfield City Hall is located at 202 South First Street, Greenfield, IA 50849; phone: 641-743-2183. Photo: Catalpa (Wallace Farm; Henry A. Wallace Birthplace), Greenfield, IA. Listed on the National Register of Historic Places in 1974. Photographed by User:C. A. Tucker (own work), 2013, [cc-by-3.0 (creativecommons.org/licenses/by/3.0)], via Wikimedia Commons, accessed October, 2015. Once a seemingly infinite span of open prairie, the land which would become Greenfield was settled in 1854. The plan for the town of Greenfield was created in 1856 when the land was officially purchased by Milton C. Munger, the man responsible for the design of Greenfield's unique town square. Before the land was purchased, two men had already constructed pole cabins. 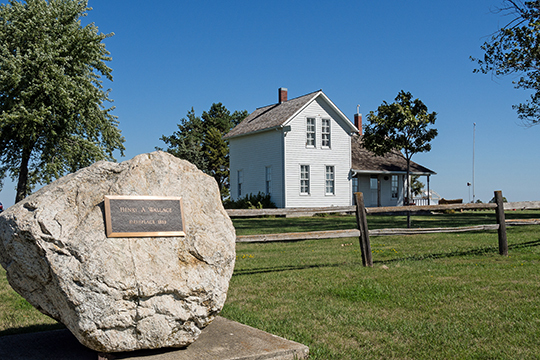 The first permanent structure in town was a stagecoach station built to serve the coaches that passed through Greenfield on their way from Des Moines to Council Bluffs. Stagecoach was the main form of transportation for travelers through town until the railroad arrived in 1879. The coming of the railroad provided farmers with freight service for their products, and helped to foster a booming local economy. When the Kirkwood Hotel was constructed in 1858, the coaches began stopping there. This freed up space within the old stagecoach station, which had also contained the first post office, and in 1859 became Greenfield's first store operated by the town's future mayor, A.P. Littleton. Littleton also opened the first school in 1861. By 1873, Greenfield's business district had three general stores, a harness shop, two blacksmiths, a drug store and the hotel. In 1875 the town's first newspaper was introduced, The Greenfield Transcript. This short lived newspaper was replaced in 1889 when E.J. Sidey established the Adair County Democrat. The paper is known today as the Adair County Free Press, and it is still owned and operated by the Sidey family though they recently moved to a different building on the square to facilitate the restoration of Hotel Greenfield. Also added to the town in 1875 was Greenfield's first bank and the town jail. Greenfield was designated as the County Seat of Adair County in 1875, and was incorporated in 1876 with A.P. Littleton as its first mayor. In 1883, a fire threatened to destroy the entire square, but ultimately resulted in the loss of just three buildings. In 1891, construction began on the courthouse that exists today, and in 1896, the E.E. Warren Opera House was built on the site of the original courthouse. By the end of the 19th century, Greenfield was a bustling town with a population of 1,200 and business lining all sides of the square. Even through the Great Depression and the World Wars the community continued to flourish. The 1950s and 60s brought scenes of a picturesque American life, but the decades that followed would take their toll. After the Midwest Farm Crisis of the 1980s, the population began to decrease and has steadily continued to drop with each subsequent decade. Adair County Comprehensive Plan, City of Greenfield, 2012, www.adaircountyiowa.org, accessed October, 2015.